This hand crank fiddle-base machine has a lot of good looks. 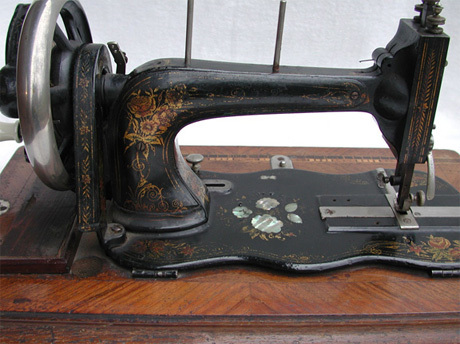 Our machine is in good condition but we haven't tried to sew with it yet. The mechanism turns very smoothly. One of our main problems now is that we don't know what make it is or have any other information about the machine. The multi-colored decals of flowers and roses are beautiful and in good shape. 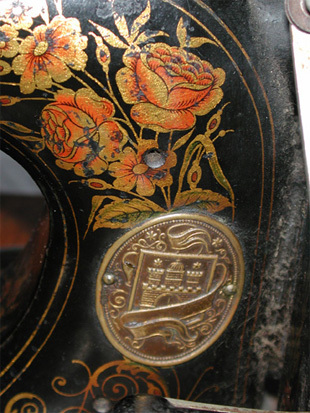 There are patches of mother-of-pearl inlay in the fiddle-back-shaped base. 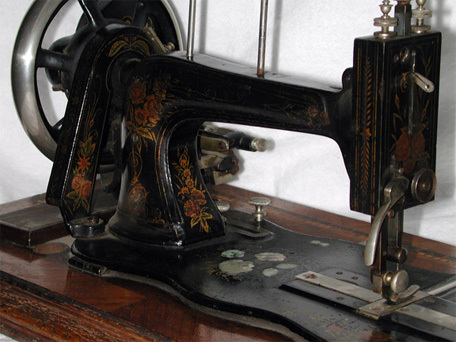 The following was copied from a listing on ebay of someone selling a machine like this, "This vintage sewing machine was manufactured by Anker-Werke A.G. in Bielefeld, Westphalia. It was made and badged for sale by J Silberberg. 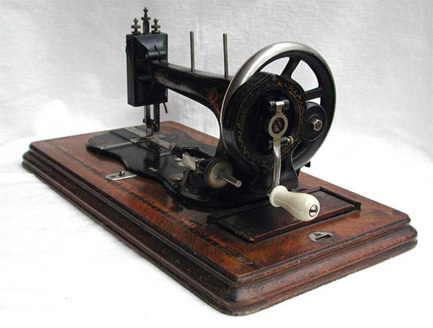 J. Silberberg, Hamburg Germany never manufactured any machines, but bought & sold machines from many different makers throughout Germany." The logo was identified as a J. Silberberg from the logos page of Needlebar.com site.